Below is a list of the top downloaded items from the PlayStation Store for the week ending October 29th. 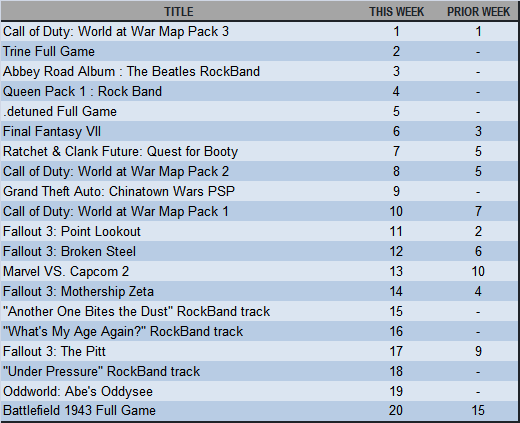 This week again sees Call of Duty: World at War and Fallout 3 dominate the charts. The number one spot is occupied by the latest COD: WAW Map Pack for the third straight week. Fallout 3’s add on content has been very popular over the past few weeks. Trine makes a strong debut at the number 2 spot and a few Rock Band tracks litter the top 20. Check back each week for the lastest and most popular downloads from the PlayStation Store.